Location: I'm most alive when I'm in the north woods on my V2. So lets say Mountain Wi. Stay tuned while I move my info. 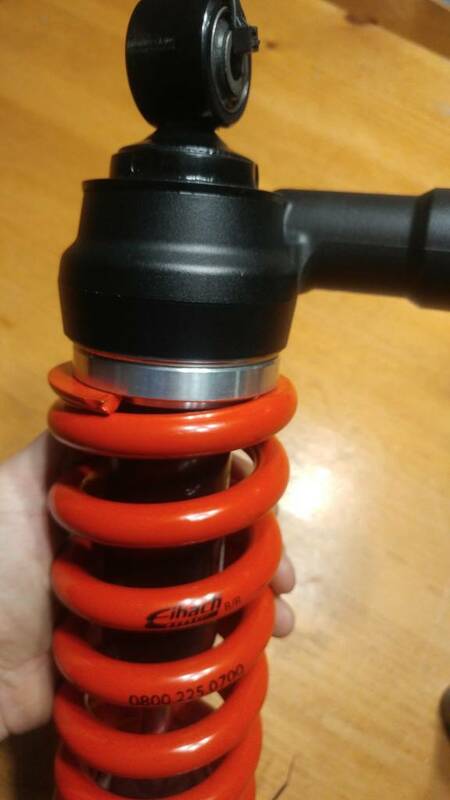 I did the Sasquatch rear shock upgrade with a 650# spring (the 700# seemed pretty stiff, so I ordered a 650# 2.25"x8" Eibach from Summit racing) the shock is definitely stiffer dampening, and looks like a new shaft, or it was professionally cross hatch polished to like new. Pending a test ride when the snow melts, it feels better just bouncing in place on the bike. Also got the 0.95kg/mm front springs from Sasquatch. 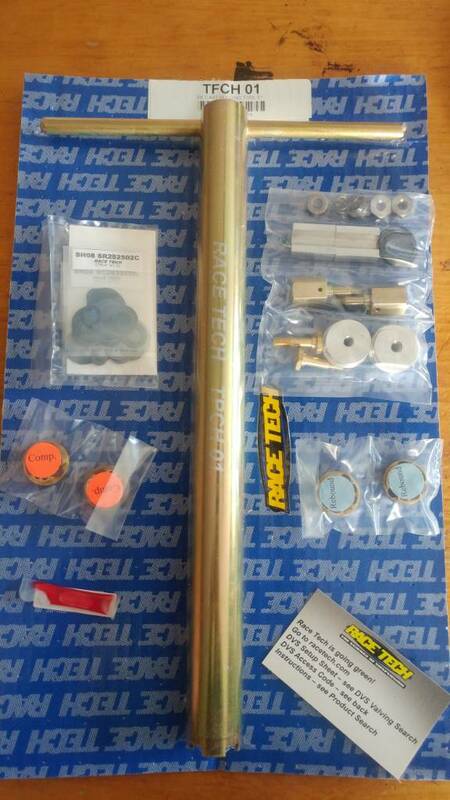 I'm in process of getting registration set up with Race Tech so I can order the gold valve combo kit and removal tool. I didn't like the stock white plastic spring preload spacer in the forks, and didn't want to just add 3 washers or use the bare tube that came with the springs. 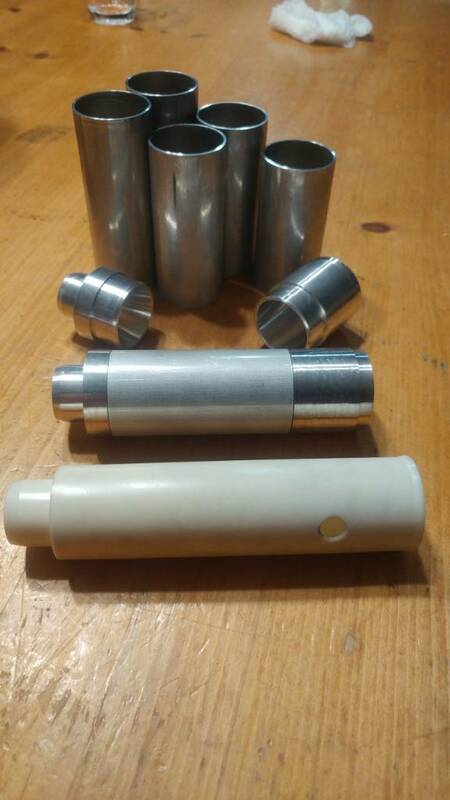 So I spun up some custom bushings to use various lengths of the aluminum tube, making it easy to adjust by swapping tube lengths to replace the plastic stock spacer altogether. At 190lbs with OEM parts, I had to crank my front preload in all the way and still had too much sag. 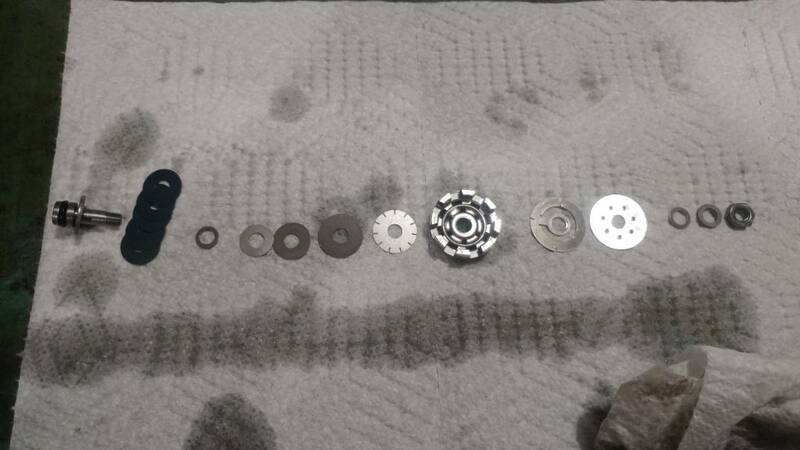 So I wanted to spin them back out, and have sag set with longer spacers so I can later crank up preload if I get fat or load the bike up. As of now. I'm starting with 10mm longer then stock setup and preload at lightest setting. Seems good on a bathroom scale, but wont know for sure till their on the bike. All installed, my preload following the Race Tech measuring procedure shows I'm at 10.2mm of preload. Their DVS valving calculator for my 195 lb, adventure riding, class B, standard stiffness showed the 0.95kg springs with a preload of 8mm and sag of 50mm. So well see where actual sag ends up when all installed. 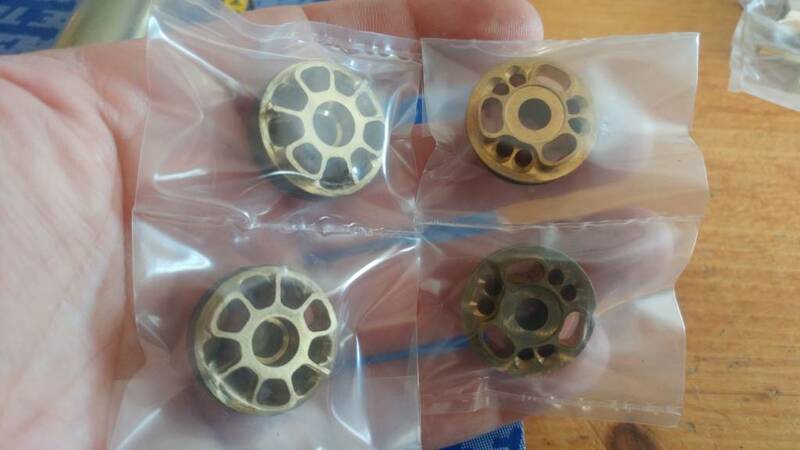 Ill follow up after the gold valves are here. Last edited by Berksglh; 02-24-2019 at 10:41 AM. 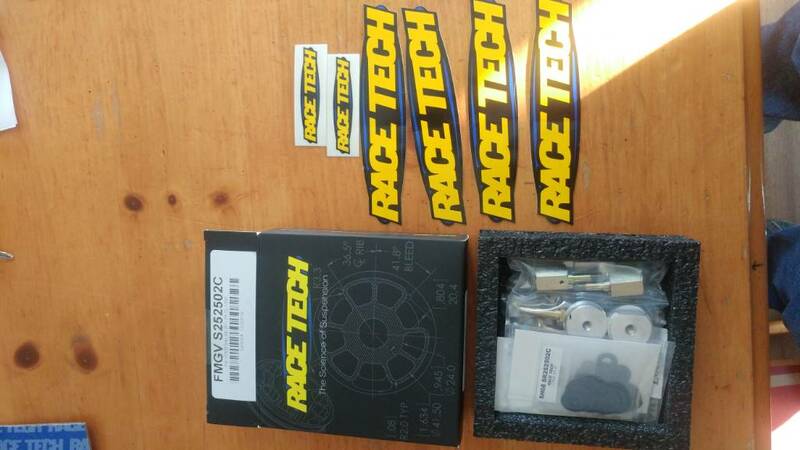 Since I havnt seen picks of the Racetech gold valve kit for the V2 yet, heres what showed up today. The combo kit, and the removal tool. There is also a card I removed that comes in the box with access codes for your 1 free online shim stack calculator session. Ill follow-up Saturday Sunday after one leg is fully assembled, and compared to the other stock unit, with and without springs. I believe this small stack would be even worse if you use a thinner more common fork fluid, as the OEM stuff was like maple syrup or maybe a 50-60 wt motor oil in how it flowed when pouring it out. Edit: the 5 spacer shims are way too thick to use in the main stack. 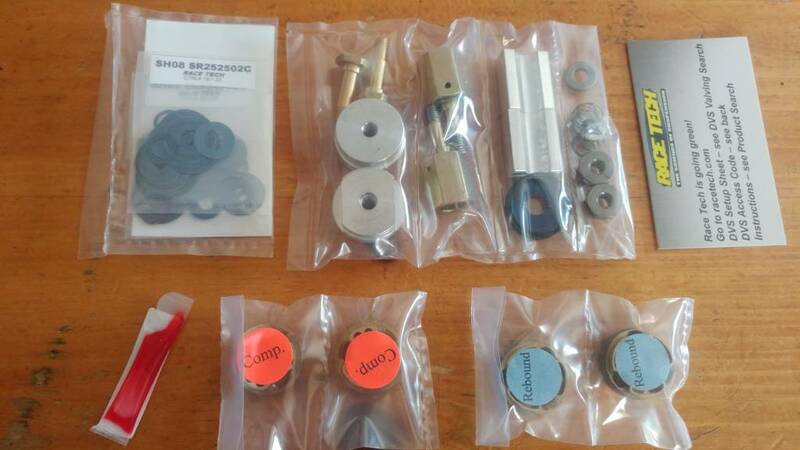 Their all 0.30mm shims. Last edited by Berksglh; 02-24-2019 at 10:13 AM. So, forks are done, low speed feels good off the bike, I don't think its possible to tell more without a fork dyno, or a proper ride. As for the job, I like to know 'how, and with what? If you have the skills to set your own valve lash, or put a new piston in a 2 stroke, you can do either of these 2 fork upgrades easy. If not, you may still be up to the task, But! You will need a few odd tools. It cant be done without the cartridge holding tool as race tech calls it. Its $65, but you need it or equivalent, cartridge cant be removed without it. 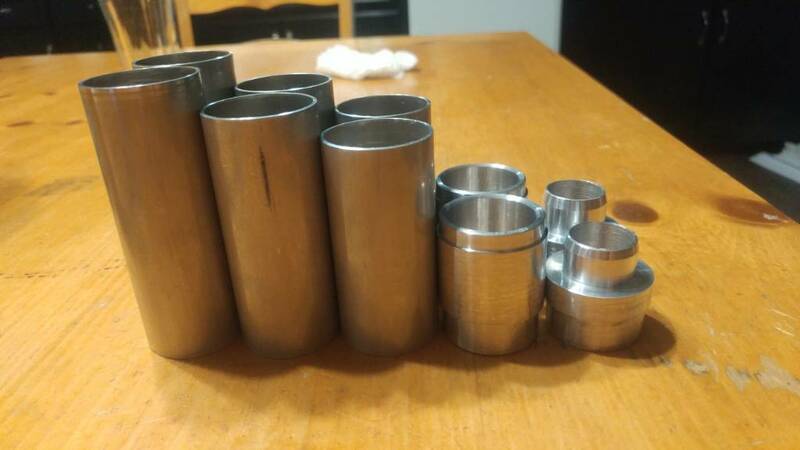 The proper spring compressor would be nice to have, but you can make due with a piece of heavy wall 2" to 2 1/2" pipe drilled and tapped with two 5/16" bolts. You will probably need a helper to insert the slotted spring retainer immediately after compressing the spring. (I used a piece of 3/16" flat stock with a 10mm slot ground in it). The OEM spring was easy, the heavier 95Kg unit was a bit hard to do on my own. 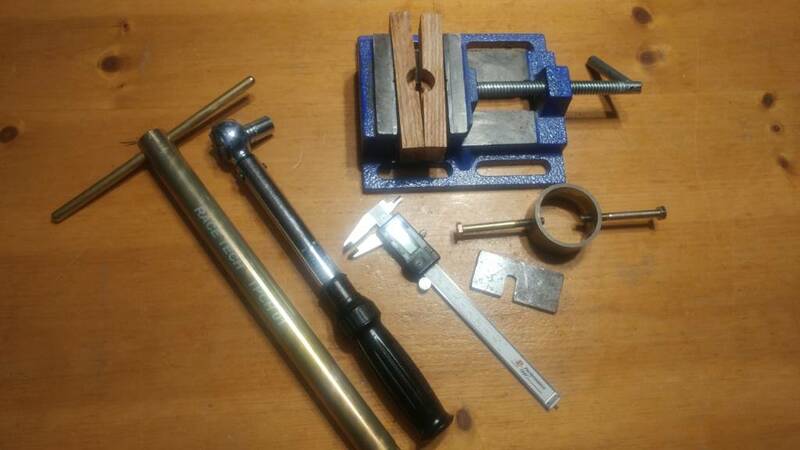 A vise with some blocks of wood for holding the cartridge when taping the valve body's off, clamping the rod holding tool (comes with the R.T. kit) and a slot drilled in the wood blocks to hold the valve body's when torquing them together. Torque wrench, hammer, chisel to tap off OEM comp body, and a scrap of wood works in the rebound valve groove to tap with hammer to remove. Ok, if that doesn't scare you, here's a few tips. 1, All 5 wt fork oils/fluids are not the same... Ignore the rating when using a different brand. The OEM oil in my forks was like maple syrup. My manual called it Suzuki L01, and web says at 40C its a viscosity of 15.5. 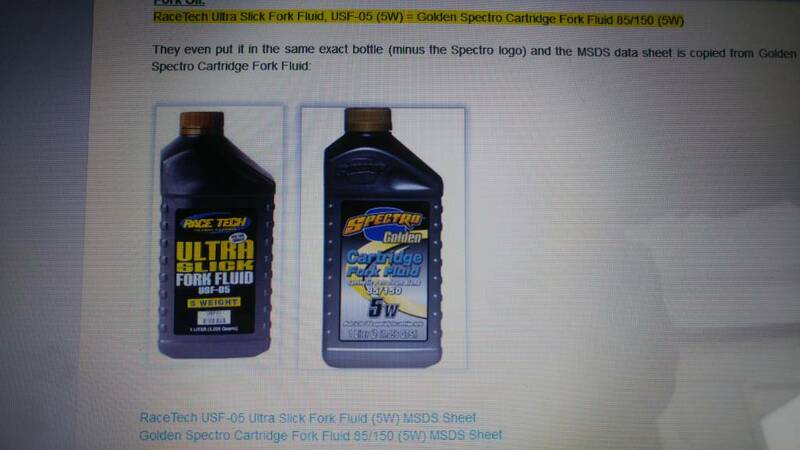 Race tech, for their valving recommends their USF-05 oil, which is said to be rebranded Spectro golden cartridge fork fluid 85/150 5wt, viscosity 16.9, and virtually the same numbers as Maxima 85/150 5wt racing formula high performance fork fluid (blue lable) viscosity of 15.9. All of which pour more like milk, which is odd, as the OEM oil was way thicker, makes me think my manual is a misprint. Do your own research. I used the 10wt 165/150 Maxima racing fork fluid (viscosity 32) because it made me feel good.? If its a bit stiff, Ill swap it for their 7 or 5 or 3wt. 2. Bleeding the cartridge. This is helpful even if your just changing the fluid. The Race tech instructions have you use a rod that threads onto the damper rod and pump it up and down. I just used either my fingers or the fork cap and pumped, which did nothing. Don't bother, a web search revealed the answer. So just pour the fluid in about 2 inches from the top, but rather then stroking the rod ( your smirking now ) pull up on the outer tube about 8", then cup your hand over the top sealing the air in, and pump it down compressing the air in the fork and hold for a second, then release the air and repeat. After 4 times, stroke the rod a few times and repeat with the hand air pressure technique. It works quick and easy. Tomorrow the forks go back on, but until all this darn snow melts, there will be no test ride till spring. Ill report back after a good ride on the trails come May. Grimmer and JustAnotherDude like this. Last edited by Berksglh; 02-24-2019 at 10:18 AM. (Edited Feb 24) These were discussed in Motocanadas post, but since I used them and some people may not go read that post, I'm re-posting my thoughts here. here's my take on them. and why I installed them and think they are a good upgrade. The K-tech clickers wont make any drastic change to dampening range, other then they have a parabolic taper flow curve. simply put, the OEM clickers make the largest change in dampening in the first half of click range from full closed, after that, there isn't much change in dampening. 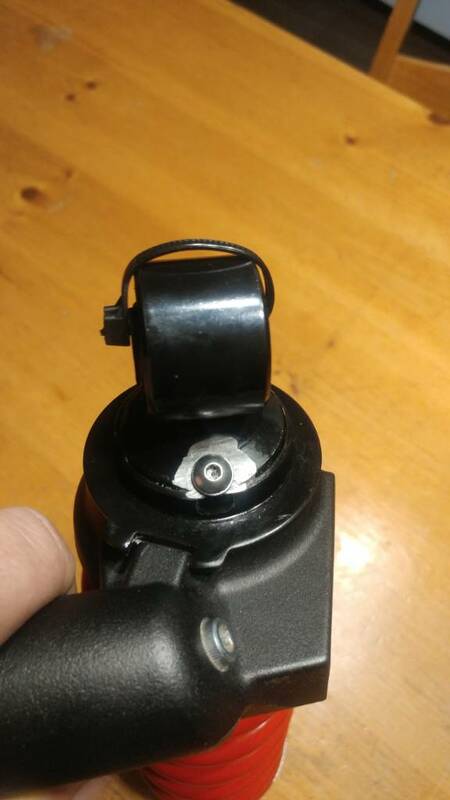 the K-tech adjusters parabolic flow curve compensates for this, making the first few clicks dampening affect a bit less, and the last few clicks a bit more, so you actually do get a larger or rather finer adjustment range that's predictable across the full range of clicks and more usable. Thanks to Motocanada for finding these little beauties. Here's the new vrs. old clickers. If you keep stock internals, the new clickers don't really seem to help, as the fork valving is so bad, you end up cranking either set tight and it still bottoms. Opening them doesn't seem to make it worse, as its so bad to start with. I do believe if you upgrade internal valving, either clicker would work fine. 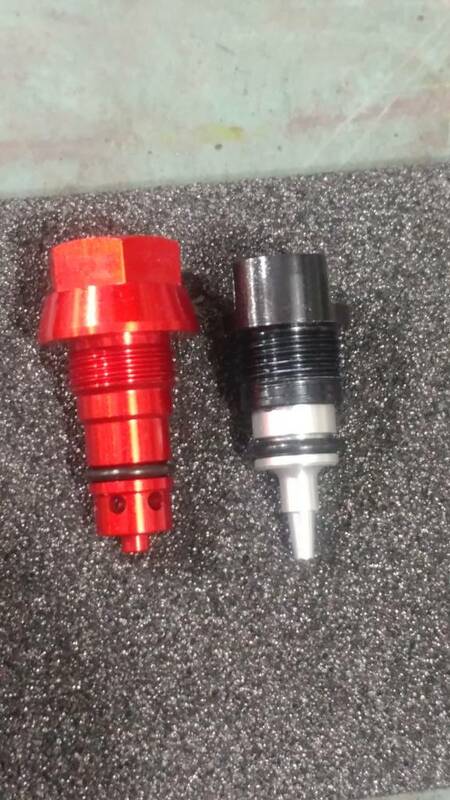 The aftermarket ones give you finer control via a better needle design. I'm going to give the Race Tech internals a shot. I don't mind changing the valving a few times to get it right if it saves me a couple hundred bucks, vrs the more expensive route. tell him the same part as I used and give him the part number. he'll sort you. 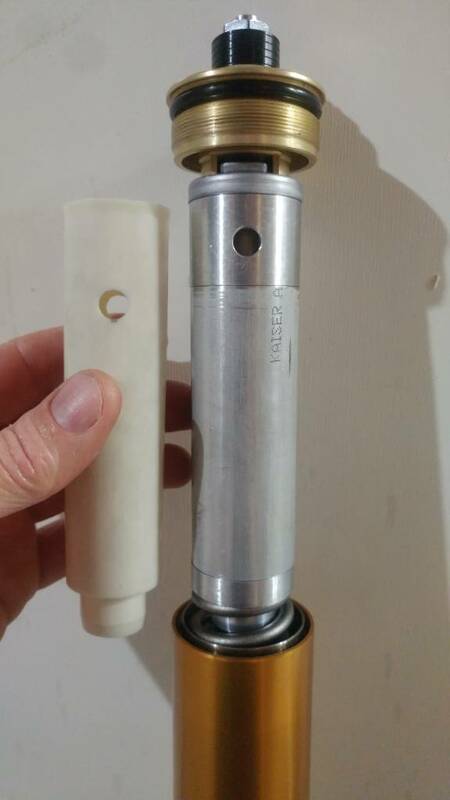 Heres a few shots of the Sasquatch modified OEM shock with Eibach spring, his spacers and the Nitrogen refill screw (self sealing ruber insert, you need a needle fill adapter to charg it. DONT remove the screw or the 150psi nitrogen charge will vent out). I later used gloss black Rustolium appliance epoxy spray paint to repaint the top of the shock where the nitrogen fill plug was added. 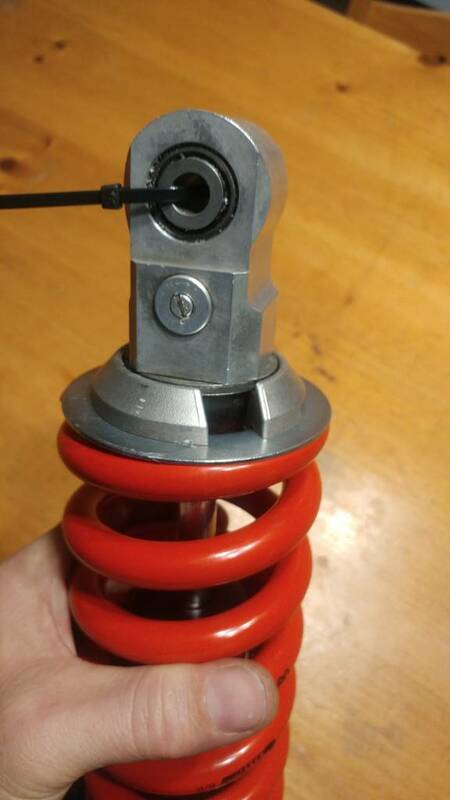 That is my only knock on the shock upgrade so far. A dab of spray paint would have gone a long way to to impress me more, but No big deal as long as he paid attention to details on the inside of the shock. Excellent write up! Thanks for posting. I'll be working on my suspension soon.